How has baseball’s All-Star Home Run Derby changed over the years? The Reds’ Todd Frazier hit a total of 39 to win the crown last night in Cincinnati. In 1989 the Rangers’ Ruben Sierra won the title by hitting a grand total of … 3. En route to an exciting win, Frazier rallied to beat Prince Fielder in the first round, 14-13. 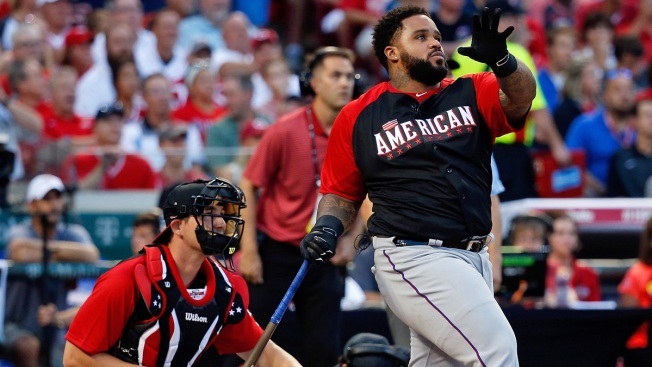 Fielder, the Rangers’ lone All-Star representative, got off to an impressive start in his attempt to join Ken Griffey, Jr. as the event’s only three-time winners. The burly left walloped eight dingers farther than 425 feet, one measured at 474. And during his timeout, Fielder brought some levity to the competition by munching on cotton candy brought to him at home plate by sons Haven and Jaden. While Frazier joined the Cubs’ Ryne Sandberg in ’90 as the Derby’s only hometown heroes, Fielder left last night with the most combined homers in the event’s history. He won the Derby in ’09 with the Brewers and ’12 with the Tigers. While the most memorable Rangers’ performance in the event’s history was produced by Josh Hamilton in ’08 at Yankee Stadium, he didn’t win the title, falling to the Twins’ Justin Morneau in the final after a devastating first couple of rounds. Along with Sierra, Juan Gonzalez (’93) is the only other Ranger to win the Derby. Fielder’s first-round was usually good enough to advance. But on a homer-filled night in Cincy, even the Derby was a homer.